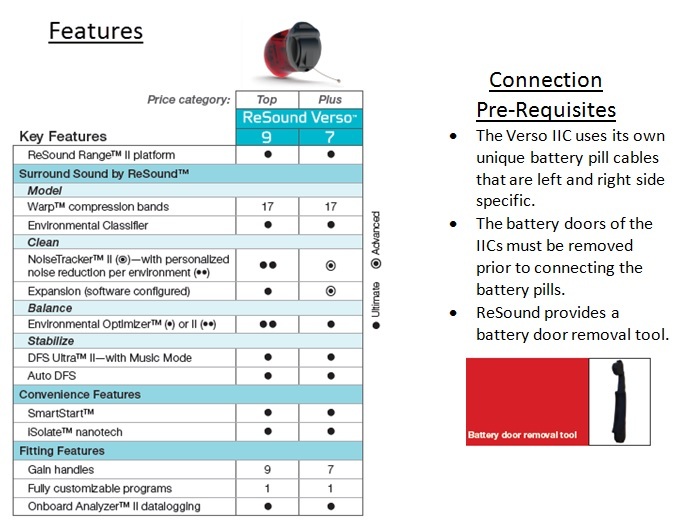 ReSound offers the Verso 9 and 7 in an IIC model, providing an ultra small, discrete fitting option. This invisible-in-the-canal (IIC) instrument provides superior sound quality and performance, without the need of taking deep impressions. Our Tech Tip this month focuses on both features of these instruments, as well as how to connect them in Aventa 3.5. Using the ReSound battery removal tool, remove the battery door of the IIC. Make certain to take note which battery door is left and right, if connecting a binaural fit, so when you place the battery doors back on, they are properly reconnected. If the battery doors are mismatched when reconnected, there is a possibility that they may cause a short to occur. Note: The battery pill has a ledge, which protrudes from the end. This will fit over the hinge pin on the hearing instrument. Insert as shown below. Be sure to push the battery pill all the way into the hearing instrument. This entry was posted in Fitting, ReSound Newsletter, Tech Tips and tagged Aventa 3.5. Bookmark the permalink. Sometimes the battery pill widens the battery contacts and it will not work when inserting the battery after programming. You’ll need to readjust the contacts to work.